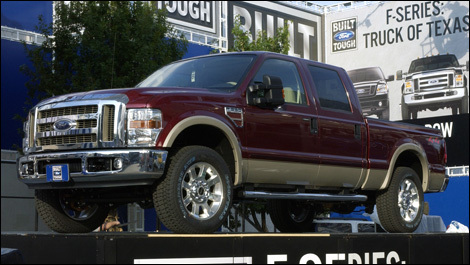 The F-Series pickup from Ford has spent half its life as a best-seller as it goes into its 60th anniversary. To help celebrate, Ford has recently announced special F-150 and Super-Duty Anniversary models to commemorate the occasion. — 241 words. Airdate: Friday, October 5, 2007, at 9 p.m. EDT on PBS. (Check local listings at http://www.pbs.org/moyers/journal/about/airdates.html.) — 176 words. Mark Trumbull of The Christian Science Monitor writes The UAW contract struggled with thorny issues facing the entire workforce. — 950 words. In vetoing reauthorization of the State Children's Health Insurance Program, George W. Bush has fired the first shot in the battle over health-care reform. The likely result will be to help mobilize support for further government intervention in the health-care market. — 828 words. BAGHDAD — Iraq has ordered $100 million worth of light military equipment from China for its police force, contending that the United States was unable to provide the materiel and is too slow to deliver arms shipments, says Iraqi President Jalal Talabani. — 1,042 words. WASHINGTON — Amid the fallout over the shooting of Iraqis by private American security guards, the House today overwhelmingly passed a bill to make all private contractors working in Iraq subject to prosecution in United States civilian courts. — 422 words. ‘We’ve just celebrated the 50th anniversary of the Sputnik flight — the first time that a man-made object went into orbit.’ — 431 words. Sarah Phillips of The Guardian UK asks why more people aren't talking about the imminent oil supply crisis. "2007 is likely to go down as the year peak oil went mainstream", predicts David Strahan on the environment pages in the Guardian UK. Strahan's bookThe Last Oil Shock is likely to play a part in instigating such discussions about the impending oil supply crisis. As is A Crude Awakening: The Oil Crash, a powerful Swiss documentary on peak oil, which finally gets a UK cinema release next month. — 809 words. Toronto’s Union Station train terminal is built from 27-metric-tonne blocks of Indiana limestone. The existing terminal, officially opened in August 1927 on Front Street between Bay and York, is the fourth version of Union Station.